To help inspire you to take action, we’ve compiled an entire list of favorite procrastination quotes. But first, more perspectives on procrastination to help you along with your aspirations. You will never regret the results you achieve by requiring yourself to focus and get stuff done. If you’re amongst the procrastinators who searched that term, it’s likely because you’re ready to do something about it. 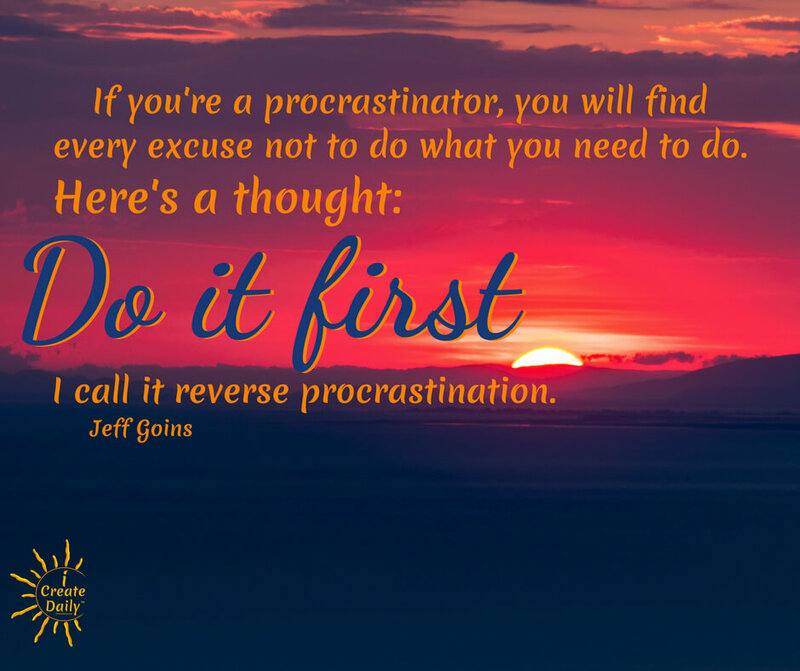 If you’re procrastinating, there may be a good reason…and a good solution! If you’re always placing other things in front of your goals, that could be an indication that your heart isn’t really in it. If that’s it, maybe it’s time to course correct. So don’t worry, but do look into this because you don’t want to delay getting on with the most important parts of your life. Not putting your work out there because you don’t have a website yet. Not publishing your work because you haven’t decided which social platform to use. Not starting your business because you haven’t incorporated your business yet. Tweaking your website even though you’ve spent months and it looks decent enough. Procrastination always comes with excuses. Excuses diffuse dreams. Action builds them. Sometimes procrastination is not a ‘who’ but a ‘what’. If you’re procrastinating on some things but not everything, it could be an indicator that you’re procrastinating when you’re not working in your zone of genius. That doesn’t mean you shouldn’t do those things. Naturally, we all have to do things that we’d rather not do. But if you’re procrastinating doing the endeavor you believe to be your passion, it may be time to examine that and delve deeper into what lights you up. What connects you to your eternal flame? If you’re uncertain as to your purpose, no worries. That’s actually common and a normal part of the process. We’ve covered finding yourself and your purpose in other articles. The purpose of this article is to share thoughts and a collection of procrastination quotes to help inspire you to action, and to keep you motivated. If you’ve been in a procrastination rut, don’t beat yourself up. Don’t be hard on yourself when it feels like you’re coming up short, or spinning your wheels. It’s completely normal to get stuck and have doubts at various places along the way. It’s just another lesson to absorb. We learn through failure, trial and error, IF we keep testing, tweaking, adjusting and adapting. One thing is certain: daily effort produces results. Daily doing dissolves doubt and keeps the horizon in view, even if that day’s ‘doing’ is re-planning for a better tomorrow. Even if that day’s doing needs to be undone or redone, that’s one mistake closer to knowing what works by ruling out what doesn’t. So as you plan your next goal, envision what you’ll want to have done over the next 30 days. Decide your next action toward that. For goal setting, you may benefit by using the 90 Day Goals Journal. You can get that or a free 30 Day Goals PDF here. Keep working your plan and your plan will work! Procrastination plagues the majority. Become the minority. Become the mover and shaker in your own world. The fastest way to plow through procrastination is to stop talking, analyzing and anguishing over what to do, and just get busy doing the next most important thing on list. One of the things that contributes to procrastination is perfectionism. Another contributor is the fear of failure. Procrastination is the Moriarty to progress. So the fastest way to kill procrastination is to starve it by doing your work… by making progress… by diving in and doing before you have it all figured out. So don’t procrastinate on your dreams. They deserve to be kept alive through doing your art. Don’t overthink things. Just do. It is in the doing that we figure things out. Fuel your future. Do the work that matters to you. Procrastinators are often dreamers who stall out when their perfect vision is impeded by real world physical plane resistance. Dreamers subsequently often feel overwhelmed as to how to bring their vision to life… it’s so big… so grand… so far away that they feel defeated before they begin. Remember… every journey begins with one step and then another. If you’re planning a vacation across the country or overseas, that’s far away too. But you begin planning and doing… planning and doing all the steps necessary to get there. Same for your journey of spinning your dreams to life. Bring your dreams to life, one day at a time… it’s the only way anyone ever arrived at theirs. Don’t let failure derail you. Let it reset your resolve to try again. Don’t make your daily goals a big deal… just a big priority. Creating daily places you in charge of the flow. When we pick up the pace, we increase our capacity. If you’re a procrastinator, you will find every excuse not to do what you need to do. Here’s a thought: Do it first. I call it reverse procrastination. Success: The more we create, the better we become at creating. Simple! The best remedy is to do the thing you feel you should be doing, but aren’t. 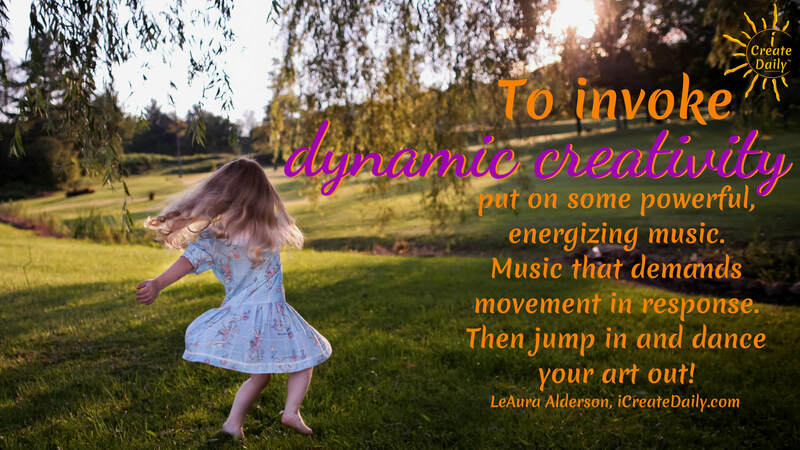 To invoke dynamic creativity put on some powerful, energizing music. Music that demands movement in response. Then jump in and dance your art out! When it comes to bringing your dreams to life, procrastination plagues the majority. Become the minority. Become the mover and shaker in your own world. Pluck the fruits of your dreams and plant them in the soil of substance, daily, and they will grow and flourish. The day is the way™.